Welcome back to the Good Morning Guys Study through Luke! I pray your past week of study was beneficial to your growth in your relationship with Christ. This is our final week in the book of Luke. On Friday I’ll post about future plans for the blog. If you’re new, feel free to jump right in and follow along. Everything you need for this week is below, including this week’s Bible Reading Plan, Reflection Questions, and Verses of the Day. Don’t forget to check back on Wednesday for my weekly blog post. Nothing in this world will last forever. We must not depend on the words we hear, the things we read, or the possessions we own to sustain us. It is God’s Word that is powerful and eternal. His words will last forever! Do you find yourself tempted to substitute the words of this world for the words of God? How can you make God’s Word more of a priority in your life? Every time we wake up and forget to talk to Jesus, we have forgotten. Every time we give into temptation and sin, we have forgotten. Every time we become independent of God and live life on our own terms, we have forgotten. Taking communion helps us to remember. We remember Jesus’ broken body and blood spilled our for us. Have you forgotten or grown numb to the truth of what Jesus did for you on the cross? Take some time right now and remember. Jesus knew that those who crucified Him were spiritually blind. They did not know what they were doing. Jesus offered love to His enemies, just as He commands us to love our enemies. Is there a spiritually blind person in your life who has hurt you and who you need to forgive? This does not mean that you will be reconciled to them, because for reconciliation, repentance is required. However, forgiveness frees you from bitterness and resentment. Who do you need to forgive today? Some of the most beautiful words in scripture are these: “He is not here, but has risen.” This is what sets Jesus apart from all other religions in history. You can search every grave but you will not find Him there. Jesus lived a sinless life, and death had no grip on Him. Our God is alive! Because Jesus is alive, our passions, priorities, plans, and past-times should look different. How has Jesus changed your life? Don’t forget to join me out on Instagram every day for the verse of the day at GuysInTheWord, as well as on our Facebook page! I’ll see you back here on Wednesday for our weekly blog post. Welcome back to the Good Morning Guys Study through Luke! I pray your past week of study was beneficial to your growth in your relationship with Christ. Many say that they love God but they spend their lives sacrificing to get more money. This is not about the size of our bank accounts but the condition of our hearts. A poor, greedy, jealous person may serve money more than a rich, grateful, generous person. God knows the truth about our hearts by what we do with our money in secret. Jesus tells the apostles that if they had faith the size of a mustard seed, they could uproot a mulberry tree. A mulberry tree has deep and strong rots and a mustard seed is tiny. Jesus says this right after telling the disciples to forgive offenses done to them. Many times, relational wounds run deep. Through faith God can restore relationships. It’s not about the size of the problem or our faith, but the size of our great God. In what area of your life do you need to increase your faith today? The persistent prayer of the widow is an example of how we must continue to pray and not give up. God does not delay in answering because He is waiting to be changed, but because He is doing a changing work inside of us. God is good and He wants us to pray to Him day and night. Are you discouraged in your prayer life right now? Have you given up or given only minimal time to prayer? There is power in prayer! What has God laid on your heart that you should be praying more for? Jesus came to seek and save the lost. Jesus came to seek and save you! This is the heart of the gospel. How long have you been saved? Never let the excitement of this truth and the passionate love God has for you grow cold. Reflect on the fact that Jesus knows your name. How does that make you feel? Everything belongs to God, but Jesus recognizes the authority of the government. When the government does not oppose God’s commands, we are to obey. As Christians, we all have a dual citizenship. We are citizens of the country we live in and citizens of the kingdom of God. How does this truth make a difference in your life? Friday: Render to Caeser the things that are Caeser’s, and to God the things that are God’s. Don’t forget to join me out on Instagram every day for the verse of the day at GuysInTheWord, as well as on our new Facebook page! Learning to pray is of utmost importance! Jesus did not teach his disciples how to preach, but He did teach them how to pray. The prayer in Luke 11 is not meant to be recited as a ritual, but rather as a pattern for our prayer life. After Jesus gave the pattern, he then gave an example of the boldness and persistence He wants us to have in our prayers. Pause and pray though the Lord’s Prayer today, then consider if there is something you have given up praying for that you need to boldly and persistently begin praying for again. To God, it does not matter what our standing in this world is. Money, titles, status, beauty, lineage, and good works are not what God looks at. Salvation is based on Jesus’s grace alone. Do you at times feel jealous of others whose standing in this world is higher than yours? One of the great mysteries of the gospel is how those who are first in this world are last in the next. How does this truth bring you comfort today? Jesus was the ultimate example of one who deserved the highest exaltation, but He was humble. True humility does not have too high an opinion of oneself, and is others-centered rather than self-centered. We are promised that those who humble themselves will one day-in eternity-be exalted. In what area of your life do you need to work on humility? The parables in Luke 15 show us that God goes after the lost, and heaven celebrates when they are found. Nothing is more precious to us as something that is lost. Think of your car keys. If they were lost, you would search for them until they were found. And when they were found, you would rejoice. In the same way, the angels rejoice when a sinner repents. Jesus doesn’t just tell us to love our enemies, he tells us how to do it. He tells us to do good to them, bless them, and pray for them. We may not feel a warm feeling of love towards them, but there are no loopholes here. We are to love our enemies through visible actions. Do you have an enemy? How can you show them love this week? The woman who washed Jesus’ feet with her tears and hair had sinned greatly in the past. But her humility and her deep emotional love for Jesus showed that she understood how great God’s forgiveness is. Pause for a moment and think back over your past and all of the sins you have committed in your lifetime. Now take a moment and write a personal prayer of thanksgiving to Jesus for His great love and forgiveness of your sins. When Jairus heard his daughter was dead, he may have lost hope. Perhaps he felt that God would not come through and he was too late. But God’s timing is always right. He can make what is dead come alive! God was stretching Jairus’ faith. All Jairus had to do was simply believe Jesus’ words to be true. Jesus said, “Do not fear, only believe.” Is there an area in your life where fear has crept in and God is stretching your faith? Jesus told His disciples that if they were willing to follow him, they were going to have to take up their cross daily. This was not easy to hear since the disciples knew that the cross was a way to execute people. The life of a Christian is a life of self-denial, sacrifice, and dying to our own wants and desires daily. In what area of your life has selfishness creeped in? How can you live a surrendered life daily. There is a common mantra in our world that encourages us to love ourselves. Jesus knows the heart of man. We already naturally love ourselves and so we are commanded to love others like we love ourselves. Just like we care about our own concerns and interests, we should care about the concerns and interests of others. Who in your life needs more of your love and care today? Today we begin our study in the book of Luke. If you don’t have your optional Journal yet, I want to encourage you to pull out a notebook and use it to write out your thoughts and reflections on this week’s study. The goal is to SOAK God’s word into your heart everyday and let it transform your life, renew your mind and create a deeper intimacy with God. Let’s take a look at the book of the Bible we are about to study. The book of Luke is a vivid account of the life of Jesus. Luke takes us on an exciting journey from Jesus’ birth, to his public ministry, death, resurrection and ascension into heaven. Salvation is clearly found in no one else but Jesus! Luke was a doctor and he took special care to record everything accurately. Of all the gospels, Luke gives us the most detailed account of Jesus’ birth. 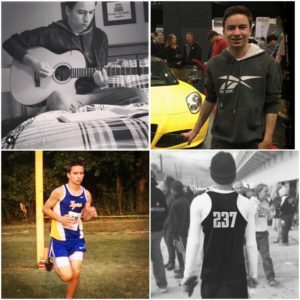 Luke shows the humanity of Jesus through showcasing his genealogy, his birth story, his growth as a boy, his prayer life and the betrayal and denial from some of his closest friends. Jesus’ many miracles and parables, written in this book, along with his compassion for the outcasts and sinners, and his love for women and children, draw us in deeper to understanding our Savior. The climax is when Jesus rises from the dead and ascends into heaven! Luke not only penned this book but he also wrote the book of Acts. These two books combined, make up one-fourth of the New Testament! The world says believe and you will receive. If you can dream it, you can achieve it. But that is not what Luke 1:37 says. It says nothing is impossible “with God.” It is God who is the source of all power and possibilities. The King of Kings, the Messiah, Emmanuel-God with us, the Alpha and Omega, the beginning and the end, our glorious Savior was born! Oh what good news this is!!! Have you placed your faith in Jesus for the forgiveness of your sins? If you haven’t, do it today! If you have, share your testimony. When did Jesus become your personal savior? At Jesus’ baptism, we see the Trinity-God the Father, God the Son, and God the Holy Spirit-3 in 1. It boggles my mind to try to grasp the awe of the Trinity. I am so thankful that we have eternity in heaven to explore this mystery. How does pondering how awesome our triune God is encourage you today? When Jesus was tempted in the wilderness, He used scripture to fight temptation. He di not use His supernatural power but rather He fought by simply wielding the sword of God’s word. When we are tempted, we have the same resource available to us that Jesus used-God’s Word. In what areas of your life do you need to be better armed with God’s WOrd to help you fight your temptations? Jesus came for those who were not just sick WITH sin but also sick OF their sin. He did not come for the self-righteous but for those humble enough to admit they are a sinner in need of a savior. Physicians fix broken bones and give healing to wounds. Jesus is the great Physician. What is one area where you need spiritual healing in your life, or have experienced spiritual healing? Don’t forget to join me out on Instagram every morning at GuysInTheWord and on Facebook at Good Morning Guys. Are you joining us? Tell a little about yourself. What is your name, where are you from and anything else you would like to share. If you have any questions – ask below. I’ll see you back here this Wednesday as we go deeper into God’s Word together. Welcome! It’s time to introduce the spring study. Our next study will begin on Monday, March 13th in the Gospel of Luke. 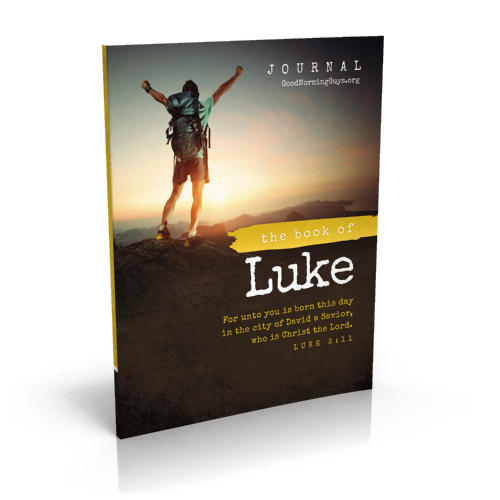 We have a Luke Journal available if you’d like to have a guide to assist you in your study. This companion Journal is NOT required to join us. It’s available now exclusively on Amazon. Check it out there! Every Monday, I’ll kick off the week with free resources and accountability here on the blog and then on Wednesdays, I’ll be here to discuss our reading from the Word, with a devotional. You can also find Good Morning Guys on Instagram —-> HERE. And on Facebook ——> HERE. I’ll be back soon, with some free resources to assist you with your Bible Study. Until then, I encourage you to subscribe in the sidebar so you don’t miss a post and follow me out on Instagram and Facebook. I hope you’ll join us as we grow in Christ! If you have any questions about our upcoming Bible Study, ask them in the comment section below.